Motorbike Leather Suits is especially designed for professional bikers to fulfill their biking passion on track with great safety. 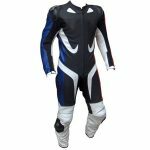 This Leather suit features excellent design & comfort, 100% genuine Cowhide leather 1.2-1.3mm, Approved internal & external Protectors on Knee, Shoulder, Elbows and Back, YKK Zippers for Performance, Outer Knee sliders for safety & performance. Genuine Cowhide Top Grain Leather 1.3 mm to 1.4 mm. Original YKK Zipper at Front, Cuffs. Stretch Material used in crotch, behind Calf and under sleeves for maximum stretch. Velcro for attaching knee puck are sewn.